I just returned from a weekend in Boston and it was fabulous. First time in the city and I fell in love! Everything about the city was incredible. From all of the historic sites and beautiful buildings to the amazing food… and lobster rolls…. and canolli. Let’s be honest, the food was uh- mazing! Although exploring an exciting new city is so much fun there is no place like home. I couldn’t wait to get back to my family. Even though reality hit when my alarm went off at 7 am, I couldn’t wait to get back into the regular routine. 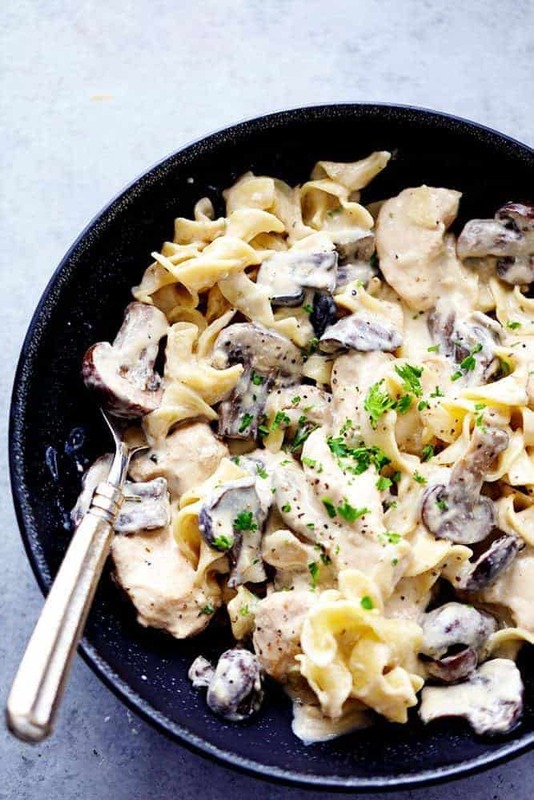 As soon as I got the kids to school I looked around the cupboards for ingredients and was able to throw this Chicken and Mushroom Stroganoff into the slow cooker. It took under 5 minutes! 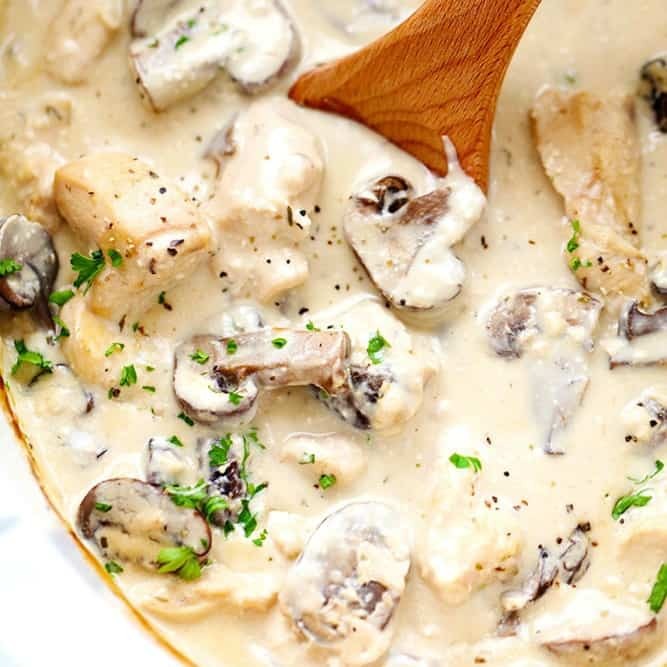 It has minimal ingredients and the chicken cooks to tender and juicy perfection in the creamy mushroom sauce. I did use a can of cream of chicken soup but if you have some extra time you can make my homemade cream of chicken soup. 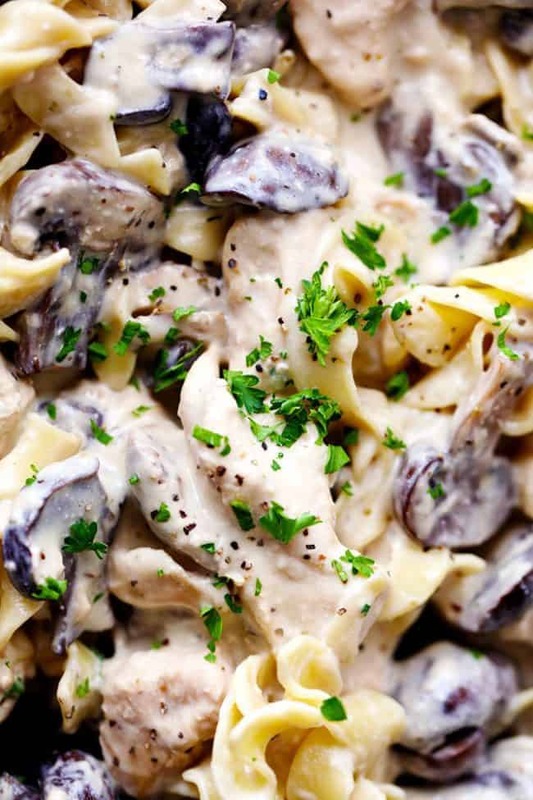 The sauce is so easy and creamy and perfect with some noodles tossed inside. 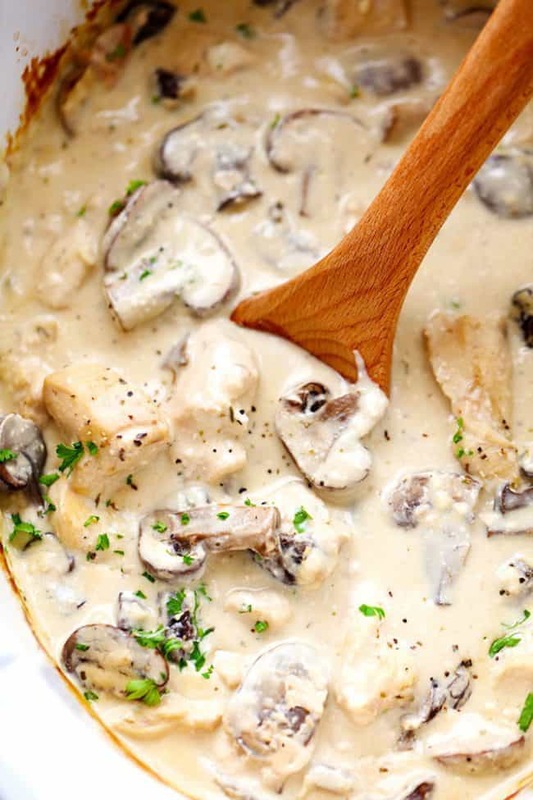 I loved the flavor in the creamy sauce and the mushrooms hidden throughout were awesome. 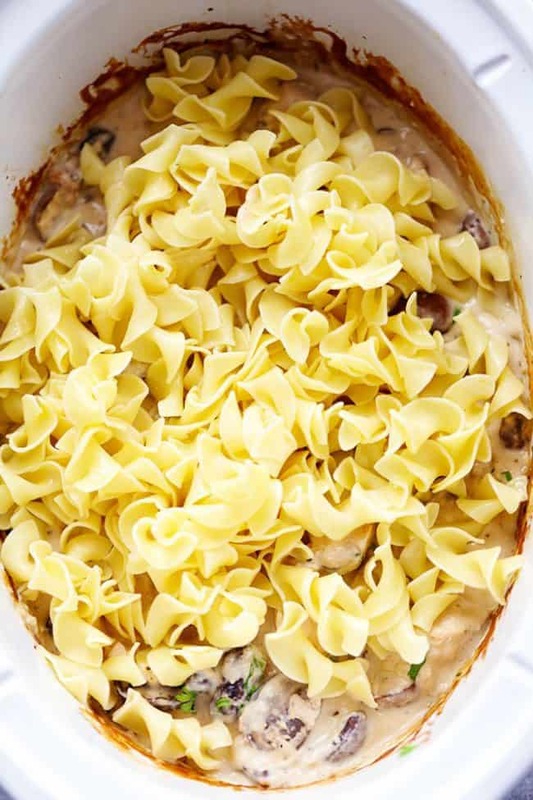 This made the perfect meal for my family and is so simple we will make it again and again! 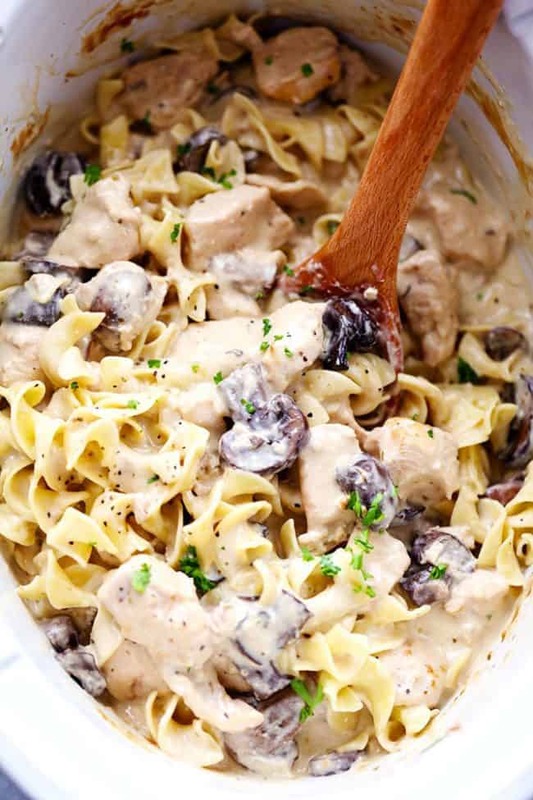 If you are looking for an easy to make slow cooker meal that your family will love, this recipe is it! This was very good! I did end up adding some cornstarch to thicken the sauce and some sour cream in the end to give it more of a stroganoff taste. And I also waited until the chicken was cooked in the slow cooker to then pull it out and cube it. I hate have to cut up uncooked chicken when I don’t have to. I also used that time to doctor the sauce. It was not anywhere near salty as I worried it may be because of other reviews. I’m sure my husband will be requesting this again soon! Thanks for the recipe! How long to cook this onca stove? Good recipe. I put the chicken breast in without cutting them. It was on low for 6 hours . The chicken wasn’t dry and fell apart with shredding. The liquid was pretty nonexistent so next time may add some chicken broth. I served it over riced cauliflower.